Why Las Vegas? First off, why not? It’s Vegas! More importantly, it’s important that we see our friends all over the US and Canada. All of our previous Connect events have been on the eastern half of the country, and we want to show some love to our West Coast friends! We’ll be announcing more specifics about the day’s event shortly — including some special guests that we’ll be bringing along. 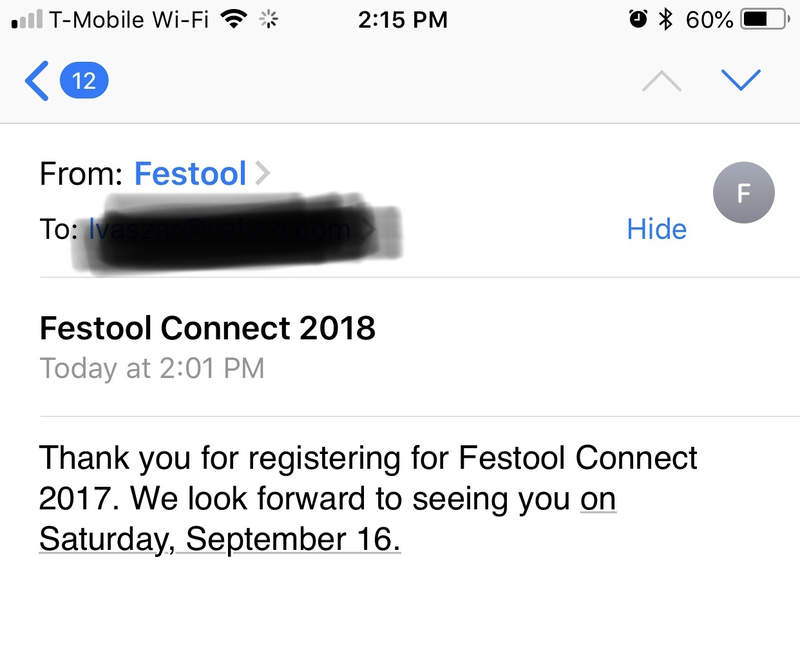 As always, Festool Connect is a free event, but we request that you register in advance. This helps us plan for food, parking, swag, etc. Register for free at festoolconnect.com. There are a lot of goodplaces to stay. If you take a end user class there they recommend sunset station (think thats the name). Rio and Texas have great buffets so you might want to look into them. Ill be staying with my compadre (BIL) as I always do. He'll be visiting this weekend Ill let him know Im coming. Remember my burger babe Avitar. She's at the Heart Attack Grill and plenty like , its a fun place w Huge Burgers and fries its awesome. There is also a Hofbrauhaus there. As you can tell I can tell you where to eat. But as far Hotels, Id say the grab closest to where the FT Connect is. “Let me see here, I’ll raise you that Rotex 150 with a TS55’. I know it seems to be a silly question but I was looking for suggestions from people that have done a class there. I thought waiting to see if Festool would make recommendations also. Thanks Jobsworth for the food recommendations, I do love to eat. I ended up booking a room at the Skyline Hotel in Henderson. Cool Glad ya found a place, I dont know anything about it but maybe we can get the Foggers together a hook up for dinner some place the night before. Lots of great places for a sit down there. Im stoked about this as I havent been able to make the Festool connects on te east coast. Im going to be festool saturated by Nov. 23 Aug festool demo day at Anderson Ply, Sept end user doors ad drawers training in NC , Roadshow in Oct and this festool connect end of Oct. its great being retired. This is my first connect also. I might try to get out to Anderson Plywood since In Touch Tools closed. Being retired is great, I just celebrated my 1 year anniversary a few months ago. Loving every minute. I read on Instagram that the venue for the event will be at The Enclave. That is a little east of the airport. Just mentioning this so that those who are looking for hotels close by can use this info for hotels etc. just looked up the enclave. Looks like I might have to wear shoes to get in the place. It looks......Faaaannnnnnnnccyyyy. The sight says it will hook you up with Hotels. didnt check prices, locations etc as Im at the BILs. It's a few miles off of the Vegas Strip. It should be a fun place for it. see you all at FESTOOL Connect 2018 ! Do we have to re register ? @jobsworth - No, you don’t have to register. However, it’s helpful for us so that we can accurately plan for food, swag, staffing, etc. He said re register. Do we need to register again if we received the incorrect message? I re-registered anyway . Got my conformation for 2018 in LV. Looking fwd to it. Told my BIL yesterday Ill be up there hanging out for a few days. @TylerC Will there be any entrance passes mailed ? Or any other information forthcoming. Passes won't be necessary. We'll have a registration table at the entrance, but you won't need a pass. Soooooo, any more people attending? If so well go getting a burger at the heart attack grill . Tom (tjbnwi) said He maybe be coming and we go go chow down. Id like to see ya wolf down a quadruple bipass burger. I'm not sure as there is a conflict with this date - (friend's wedding) but if I do go, I'll take you up on that offer. Well I will finally get to meet some more of the Foggers from the other side of the Mississippi! Tom Silva and Kevin O'Connor from This Old House will be there. Also, although he won't be there in an official capacity that we can really promote, Mike Holmes Jr. will be there as well. BUT WAIT, THERE'S MORE! The first 500 pre-registered attendees will receive a 3.5 m sleeved hose (500276). Be sure to register at festoolconnect.com.